Let’s throw a little cold water on the expectations for the Falcons. They had a nice run last year but by the end of the season there were signs that they weren’t a dominant team. Matt Ryan’s effectiveness dropped the final five weeks of the season. The running game produced some impressive statistics but when the strength of the defenses faced were taken into account the Falcons’ rushing DVOA was only 13th in the NFL. The Falcons were also an unusually healthy team last year, something they cannot count on to repeat itself. There is some good news for Atlanta: Tony Gonzalez. The DVOA projections are not taking the trade into account, as it is very difficult to judge the addition of one of the greatest tight ends of all time. His addition should draw attention from wide receivers Roddy White and Michael Jenkins, both of whom played very well last year. Running back Michael Turner was everything the Falcons hoped he would be but I am concerned about his workload. Running backs usually wear down when overused and Turner is in that danger zone. The offensive line had a tremendous year in 2008, particularly given how awful they were in 2007 and the injury to offensive tackle Sam Baker. Left tackle Todd Weiner stepped in and performed admirably in Baker’s stead but he is gone now. If Baker can remain healthy this year the offensive line should be able to maintain its level of play from 2008. 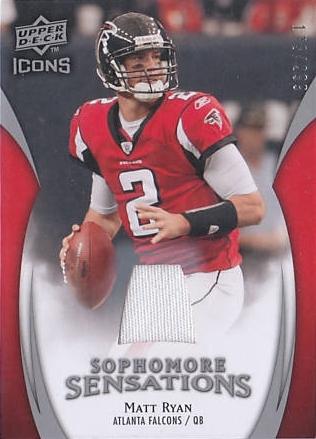 Quarterback Matt Ryan had a fantastic rookie season and it will be interesting to see if he can maintain the level of play he produced in early 2008. Last year Ryan faced an easier schedule than the one he faces this year. One other player of note: wide receiver Harry Douglas has the athleticism to become an excellent slot receiver. If he matures, the Falcons’ offense could rival that of the Saints for best in the division. The major problems on paper for the Falcons are not on offense. The scouts rate their defense as slightly better than that of the Detroit Lions, faint praise indeed. Defensive end John Abraham was absolutely dominant as a pass rusher but was not particularly effective against the run. The Falcons drafted defensive tackle Peria Jerry in the first round to help shore up their defensive line, and added defensive end Lawrence Sidbury in the 4th round. Actually, the Falcons’ first five picks were used on defenders. They took safety William Moore in the 2nd round, cornerback Chris Owens in the 3rd round, and cornerback William Middleton in the 5th round. A strong case can be made that Peria Jerry was the best defensive tackle in the draft, and he should be a great fit for the Falcons. Sidbury looks like he will need some time to develop, although he could see some use in nickel formations. I don’t know much about Middleton apart from the fact that he was Middleton’s MVP, but Owens is a tremendous athlete limited by his size. If the Falcons coaches can protect him from being physically overmatched, he could contribute right away. Defensive end Jamaal Anderson is young and still improving. He was effective against the run last year but needs to improve his pass rush. Defensive tackle Jonathan Babineaux should benefit from the addition of Peria Jerry. Middle linebacker Curtis Lofton is the only returning starter. He was quite good as a rookie. The rest of the linebackers can be considered “replacement level” talent. As much as the linebacker corps cannot be considered an area of strength, the defensive backfield looks flammable. The Falcons lost their best cornerback, Domonique Foxworth, in free agency. Cornerback Chris Houston will be one of the starters but I cannot tell you who will win the other starting job. Right now my best guess is Chevis Jackson. William Moore will likely be the starting strong safety. Free safety Erik Coleman must improve or risk being replaced after (or during) the season. The Falcons’ special teams are above average, mostly due to excellent coverage units. Despite going 11-5 last year, Falcons management knows they are in the midst of a long term rebuilding project. The defense is a mix of very young players and aged veterans. I think the Falcons are on a long term upswing but for now the defense and the schedule lead me to expect a losing season, 7-9. No team ended their 2008 season on a more shocking note than the Carolina Panthers. They got absolutely destroyed at home by the Arizona Cardinals in the divisional round of the NFC playoffs. Clearly management likes the roster, as the Panthers are returning 21 out of 22 starters, with the only change a slight one to the secondary. The biggest issue for the Panthers is their exodus of depth. Actually, the Panthers have a few issues. The one that ended their season last year was Jake Delhomme’s accuracy, or lack thereof. 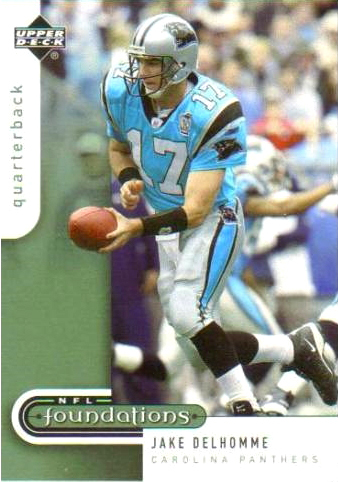 Delhomme turned the ball over six times against the Cardinals. The Panthers brought in coach Rip Scherer to help Delhomme improve his accuracy. He completed 59.4% of his passes last year, and has a lifetime completion rate of 59.7%. He also averages an interception a game. Those are not good numbers. Delhomme is 34 years old and has a gunslinger mentality. It is hard to say he takes too many risks since some pay off, but when he has an off day, well, six turnovers. Delhomme was not asked to carry the offense, as the running game improved as the season wore on. Before the 2008 season the offensive line switched over from a zone-blocking scheme to a more physical power blocking scheme and the move paid off. In fact the offensive line was superb in 2009. Rookie Jeff Otah fit in immediately at right tackle, Jeff Gross was excellent at left tackle, and Ryan Kalil was superb at center. Little is guaranteed in the NFL but the Panthers’ offensive line looks to be one of the best in 2009. Wide receiver Steve Smith is still a star but he is going to need more help this season. Wide receiver Muhsin Muhammad is not nearly as good as he used to be and wide receiver Dwayne Jarrett is the player most likely to step up and become the Panthers’ #2 receiver. Jarrett is considered to be a bust but he is only 23 years old and has the size to dominate smaller cornerbacks. I’m not sure where else on the roster to look for targets. Tight end Gary Barnidge could become one of Delhomme’s options if he continues to develop. As bad as Delhomme imploded at the end of last year he wasn’t the only noticeable implosion on the team. The defense collapsed against the run late last season, most noticeably in the Giants game. Defensive tackle Ma’ake Kemoeatu (Kemo eat you) missed the Giants game with an injury (indigestion?) but when healthy he is an excellent run stuffer. Defensive tackle Damione Lewis did a very good job stepping into departed tackle Kris Jenkins’s shoes but the lack of depth at the position came back to haunt the Panthers. The Panthers recognized this problem and drafted DT Corey Irvin in the 3rd round. He doesn’t have the size and strength he’ll need to be an every down player in the NFL but he should be able to provide some rest for the starters. Defensive end Julius Peppers had a monster year, possibly due to the fact that he was in the last year of a contract. The team franchised him so he will again be playing for a new contract. Defensive end Charles Johnson was effective in limited use last season. He will be asked to play a larger role this season. The Panthers also traded up to draft DE Everette Brown. Some scouts had him ranked above Aaron Maybin and Tyson Jackson. He is a bit raw but has tremendous upside as a pass rush specialist. I’m a big fan of ILB Jon Beason. He is going to have a bit more pass coverage responsibility this year but he has the speed to handle that. The Panthers have imported defensive coordinator Ron Meeks and he is a Tampa-2 disciple. Thomas Davis has become an excellent weakside linebacker but the Panthers have a bit of a problem at strongside linebacker. Na’il Diggs currently holds that job and they just gave him an extension but he is a clear weak link. The secondary should be quite good despite the loss of CB Ken Lucas. Cornerback Chris Gamble has become an excellent player. Richard Marshall will move from nickel cornerback to second starter. Second round draft pick Sherrod Martin will move into the nickel slot. Strong safety Chris Harris is a very hard hitter but it is free safety Charles Godfrey who could develop into a star. The Panthers have two kickers and have been successful with that plan. Kickoff specialist Rhys Lloyd was excellent in that job while John Kasay was quite effective on field goals. Apart from those two, the Panthers’ special teams are not particularly good. The truth is, this roster was one of the Super Bowl favorites heading into the playoffs last year. The running game was excellent, Steve Smith was very effective, and Peppers had a monster season. I can’t expect the same level of performance, particularly given how tough their schedule is. Still, they have the best defense in their division and an above average offense so I’ll credit them with a 9-7 record. I think we can all agree the Saints have an impressive offense. Quarterback Drew Brees made a run at Marino’s yardage record last season. Wide receiver Marquis Colston has exactly 3000 yards receiving over the last 3 years. Not bad for a 7th round pick. He had microfracture surgery in January but should be 100% by week 1. Reggie Bush has not become the star everyone expected, but between him and Pierre Thomas the Saints have a balanced and talented backfield. The wide receiving corps is deep and filled with breakout threats such as Robert Meachem and Devery Henderson. Billy Miller is the best of a fairly deep group of tight ends. The Saints’ offensive line isn’t quite as good as Drew Brees makes it look, but it is still very good. The guards are the strongest part of the line, but the Saints have very little depth at tackle so an injury there would be more damaging. One final note on the Saints offense: It was fine under center but absolutely devastating from a shotgun formation. If the Saints offense has an Achilles heel it is turnovers but given how many points the Saints score I’d say they get a good rate of return on the risks they take. The bigger problems for the Saints are on defense. Usually I don’t focus on coordinators but the Saints have brought in Gregg Williams to be their defensive coordinator. Williams is an exceedingly aggressive coach. He has some decent tools to work with, or at least will after the Starcaps situation is resolved. Defensive ends Will Smith and Charles Grant have both been implicated in the scandal. Smith has been weighed down by double teams and will benefit from the offense being distracted by other rushers. Defensive tackle Sedrick Ellis showed improvement over the course of his rookie season. The best Saints defender is middle linebacker Jonathan Vilma. Unfortunately the rest of the linebacker corps is rather lousy. The Saints drafted cornerback Malcolm Jenkins in the first round. I had him as the top cornerback in the draft. Cornerback Tracy Porter showed some nice skills last season before he got hurt. They and the rest of the Saints cornerbacks must prepare to cover men one-on-one, as Gregg Williams is going to send most of his defense after the quarterback. 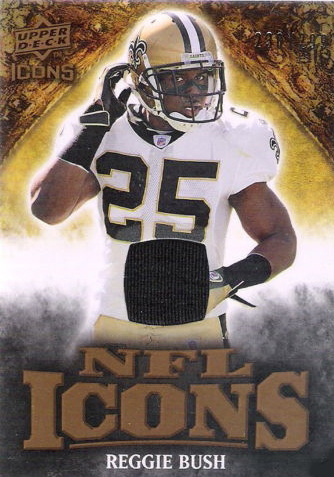 The only safety that could become a plus for the Saints is rookie free safety Chip Vaughn. He is a tremendous athlete and will help out on special teams while he learns the finer points of playing safety in the NFL. If the Saints’ defense was going to be effective without blitzing, then perhaps Williams would be a bad hire. Given the low expectations for the defense I like the strategy. The Saints gave up lots of big plays last season playing passively. This season they should at least have a lot of positive plays to weigh against the inevitable big plays they give up. The Saints understand that they have some problems with their special teams units. As such they drafted punter Thomas Morstead. He is known for excellent hang time but is a bit slow to get punts off, so that is something to watch out for. If he can’t get his punts off on time the Saints have Glenn Pakulak. Kicker Garret Hartley has a strong leg and should be quite effective. Reggie Bush isn’t quite the return threat people think he is but overall the Saints’ special teams units should be above average this season. I like coach Sean Payton but he has a tough job this year. His offense is excellent but that was true last year when the Saints were mediocre. The Saints will go as far as their defense takes them. If only because offense is more consistent than defense, I’ll entrust the Saints with a 10-6 record. This team had a winning record last year. In fact, they were 9-3 at one point. At that point the defense collapsed. Some people have blamed coach Monte Kiffin, who was distracted by his son and the University of Tennessee but the fact is it was the players on the field who got mauled. The Bucs traded up to draft quarterback Josh Freeman. That might be a great move for the long term. Josh Freeman has tremendous upside ($1, Hubie Brown). He is less ready to start than his fellow first round quarterbacks (Mark Sanchez, Matt Stafford). The Bucs currently have five quarterbacks on their roster. Between Luke McCown, Brian Griese, Byron Leftwich, and Josh Johnson the Bucs have plenty of choices as to who is least ineffective in their West coast style offense. Whoever wins the quarterback competition will have some talent around him. The Bucs signed tight end Kellen Winslow Jr., running back Derrick Ward, and re-signed wide receiver Antonio Bryant. I’m not sure what to make of receiver Michael Clayton. He re-signed with the Bucs but I’m skeptical that he’ll help the offense. Ward and running back Earnest Graham should complement each other. The Bucs’ offensive line has switched from a power blocking system to a zone blocking system. That fits their personnel quite well. 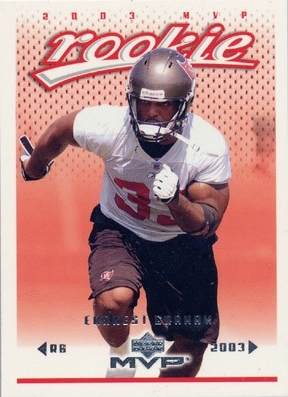 The interior of the Bucs’ line is superb, although Guard Arron Sears might be having concussion issues. Guard Davin Joseph was excellent in 2008, as was center Jeff Faine. The tackles are serviceable but not great. The biggest change for the Bucs’ defense is not personnel. They are switching to a new defensive scheme instead of the traditional Tampa-2. Expect to see a little less speed and a little more size from the Bucs’ defensive line. The Bucs have talent on their defensive line but depth at tackle was a problem in 2008. Defensive end Gaines Adams is dominant at times, but he wore down as the season progressed. The same can be said for defensive tackle Ryan Sims, although he wasn’t quite the threat that Adams was. Stylez G. White (don’t ask) was fantastic in 2007, but only decent in 2008. Defensive end Jimmy Wilkerson was a bit more consistent than White in 2008 but both are above average. The Bucs invested their 3rd and 4th round picks on defensive lineman, but both looked like reaches to me. In the 3rd round they grabbed defensive tackle Roy Miller and in the 4th round they took Kyle Moore. Both have issues with being overpowered but perhaps the Bucs have a vision in mind for them. Miller’s high effort level was noticeable, and Moore has significant upside ($1). Defensive tackle Chris Hovan is not the star he once was. Miller is going to be asked to contribute immediately. Last year the linebacker corps were superb against the pass, but the unit has been reworked. Middle linebacker Barrett Rudd remains but Derrick Brooks and Cato June are gone. Jermaine Phillips and Angelo Crowell will take their places. I expect a bit of a drop off compared to last season. The Bucs have a nice pair of young corners in Aqib Talib and Elbert Mack. Cornerback Ronde Barber is 34 years old and slipping. I wonder how long he will keep his job. Free safety Tanard Jackson is another young excellent defender. Free safety Sabby Piscitelli is not quite as good as Jackson, but he isn’t a liability. The Bucs have excellent coverage units and are bringing in Mike Nugent to improve their kicking game. Punter Josh Bidwell is pretty good. Clifton Smith was noticeably effective returning both kicks and punts. Overall, the Bucs’ special teams should be among the best in the NFL. Part of the reason the scouts are grading the Bucs so poorly is the confusion as to who will lead the offense, although there is a healthy skepticism as to the defensive scheme as well. The Bucs have an extremely tough schedule and are short 1 home game (London, October 25th vs. the Patriots). If I had faith in any of the Bucs’ five quarterbacks I’d give them 6 or 7 wins. As is, they look like a five win team to me. 5-11.